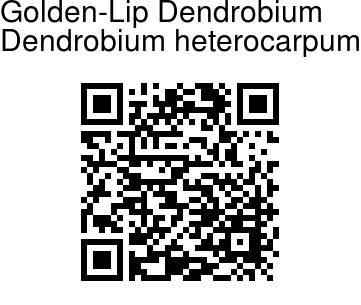 Golden-Lip Dendrobium is a small to giant sized orchid, found growing on trees, with spindle-shaped or nearly cylindrical, erect or drooping, many noded stem which turn yellow with age, with tubular basal sheaths. Flowers are white, in short, 2-4 flowered raceme on leafless stem; dorsal sepal 23 x 9 mm, oblong-lanceshaped, blunt, 5-veined; lateral sepals 21 x 6-11 mm, obliquely ovate-oblong, lanceshaped, somewhat pointed, 7-veined. Petals are 2.3 x 1.0-1.2 cm, obliquely elliptic, apiculate, 7-veined; lip 2.1 x 1.0-1.5 cm, quadrately ovate, apiculate, hairy within; side lobes ovate, blunt; midlobe ovate, pointed, apiculate, margins, crenulate. The plant carries deciduous, strap-shaped or oblong-lanceshaped, pointed to blunt leaves. It blooms in the winter, spring and summer on a lateral, short, few to several, long-lived, sometimes fragrant, flowered inflorescence that arises from the nodes on 2 to 3 year old leafless canes. 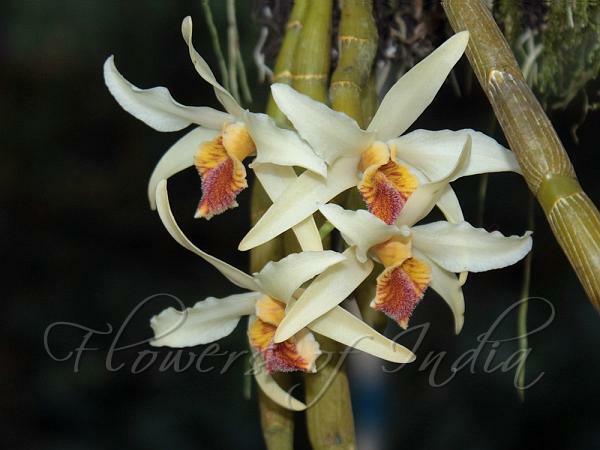 Golden-Lip Dendrobium is found in eastern Himalayas, from Nepal to Bhutan, NE India, Chinese Himalayas and SE Asia, at altitudes of 100-1800 m. Flowering: January-March.